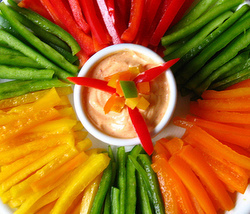 Crudites are vegetables cut up in equal size served with any number of dips. The more the merrier. You will be making a very healthy recipe for Your guests to thoroughly enjoy. After all, party appetizer recipes should build up the party mood.Right???? 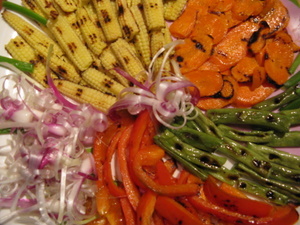 Use as many vegetables you can, with different colors. This will contribute toward an appealing presentation. 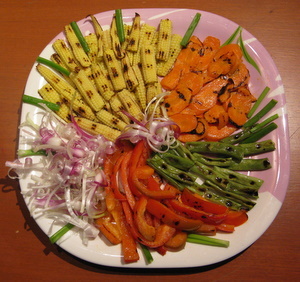 Cut the vegetables in the desired shape (thin slices will be best). Apply a little olive oil on the vegetables. Rub it on both sides of all the sliced veggies all except, the spring onions. Heat a griddle and start placing the vegetables on it in batches. Please don't overcrowd the griddle and don't put any oil in the griddle. Cook for 2 minutes on each side and remove. Arrange on a platter and serve with dips. You can use whatever vegetables you want for both of these recipes. Hope you liked both these party appetizer recipes. Would you like to check out some more easy appetizer recipes?